This chapter focuses on India’s solidarity with the liberation struggle in South Africa. 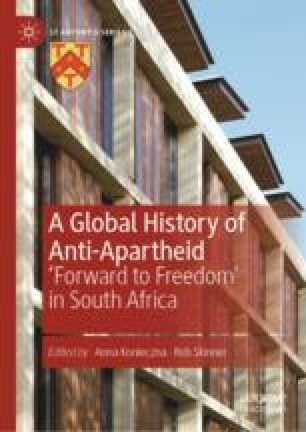 India played a key role in the internationalisation of the South African freedom cause, and the birth of a global Anti-Apartheid movement can be dated back to 1946, when India took up the issue of the treatment of South African Indians at the inaugural session of the United Nations. The opening of an office or mission by the ANC in New Delhi in 1967 is another important demonstration of the Indian government’s commitment to South Africa’s liberation, at a delicate time when the liberation movement had turned to armed struggle, while at the same time suffering major blows in South Africa and having to adapt to new and difficult exile conditions. However, the paper tries to understand India’s place in the global Anti-Apartheid movement beyond the level of international diplomacy, to which international solidarity is often reduced. It does so by analysing this history of solidarity through the lens of Dr. Yusuf Dadoo’s biography. Based on ANC documents, archival letters to Mota (as Dadoo was affectionately known) by a mysterious ‘Raj Kumar’ and interviews with key players, the chapter shows how India was part of a transnational network—with Dadoo at its centre—that sought to rebuild internal political resistance against the apartheid state in the light of the resolutions adopted at the 1969 Morogoro conference. Official Documents System of the United Nations. https://documents-dds-ny.un.org. South African Communist Party. https://www.sacp.org.za. Struggles for Freedom. Aluka Digital Library. https://about.jstor.org/whats-in-jstor/primary-sources/strugglesfreedom-southern-africa/.